We’ve arrived safely in Kefalonia after a very early (3am!) start. They say you should never work with children or animals. Perhaps we should extend that to travel…? To begin with, Sammy (the cat) tried to get in the taxi with us, then 10 minutes into our journey we realised that Olivia had smuggled in her favourite, DOUBLE bed sized furry blanket and a backpack that took us over our baggage allowance. There was a rather unfortunate and fairly dramatic scene on the pavement at the Terminal drop off, where I had to wrestle this enormous fur blanket from her. Not at all funny at the time (fishwife screams from me, sobs from her) but it must have been quite amusing to anyone watching. 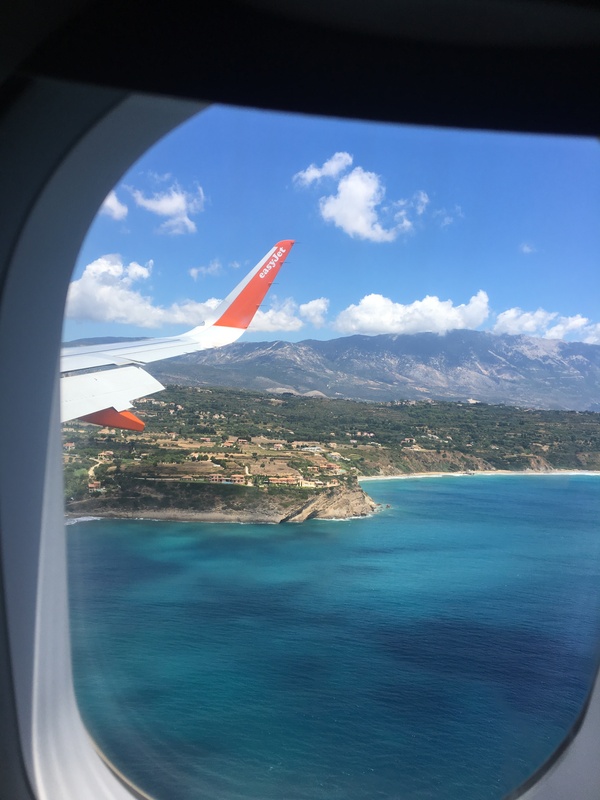 One little travel tip that I wanted to share with you, is if you have any electricals to buy, and are flying any time soon, have a look at Dixons Travel. They stock all the big brands (Beats, Bose, Apple, Canon etc) and their prices guarantee to beat Amazon, John Lewis and Argos. You call them in advance of your travel date, to check stock and price and they will reserve the product for you, to be collected on the day of your travel. We had wanted to get a good quality BOSE bluetooth speaker so that we could listen to music by the pool, and it was ready and waiting for me to collect as soon as I got through security. Such an easy way to shop and it also meant that I didn’t need to pack it. I suspect one of the THREE pool inflatables I have packed won’t make the return journey, and of course you’re always bottles of suncream lighter on the way back, so getting it home shouldn’t be a problem. 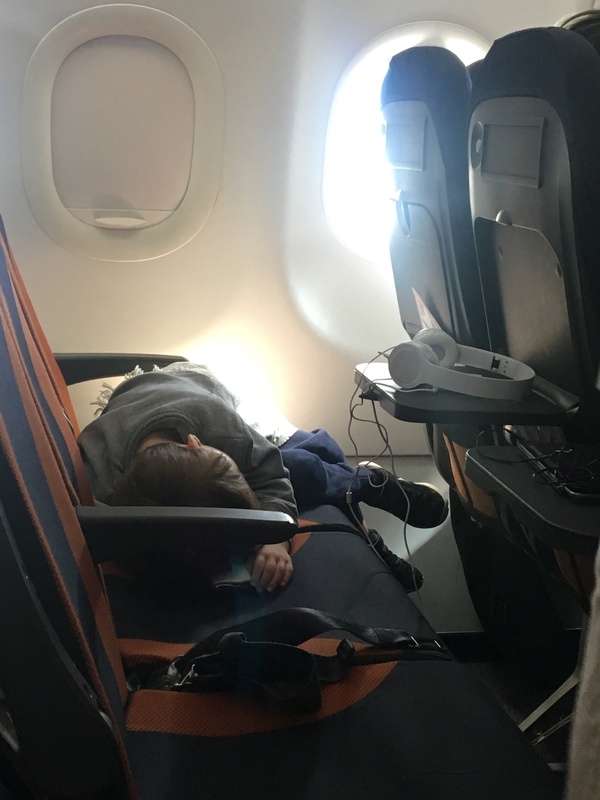 Another flying tip – remember to take something to cover the children with on the plane. I only packed one hammam towel for Charlie in my hand luggage and they ended up fighting over it because the girls legs were cold on the plane. (As you can imagine I didn’t hear the end of the blanket story!) I also forgot to carry painkillers or calpol in my hand luggage. BIG mistake as there were tummy aches and headaches all round. On the flight, once everyone was settled, I popped on one my amazing spacemasks and listened to my Headspace app. If you don’t know about Headspace it’s an app that helps you to relax by completing short, daily meditations. 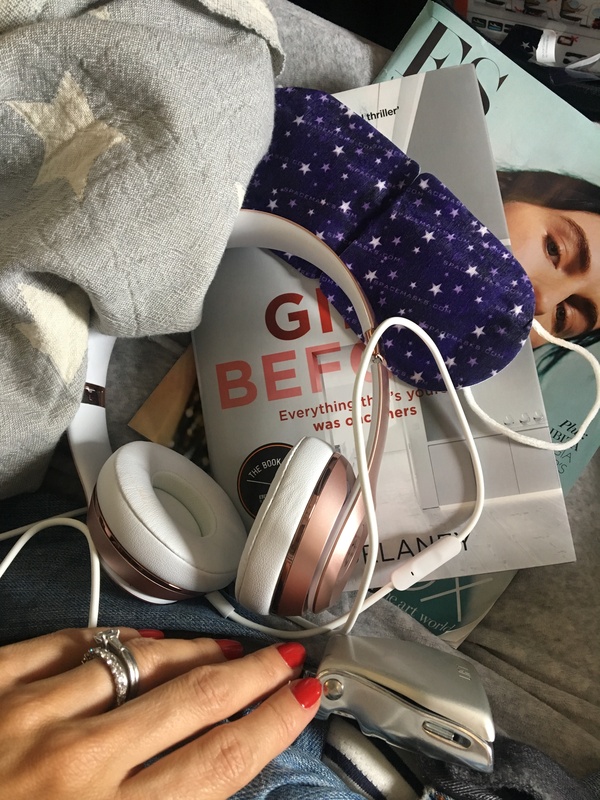 It’s really just focussing on your breathing and practising mindfulness, but I’d highly recommend it for anyone who feels like they need a bit of headspace…I’m a bit of a nervous flier and it really helped to calm my nerves and relax after the stress of the journey. 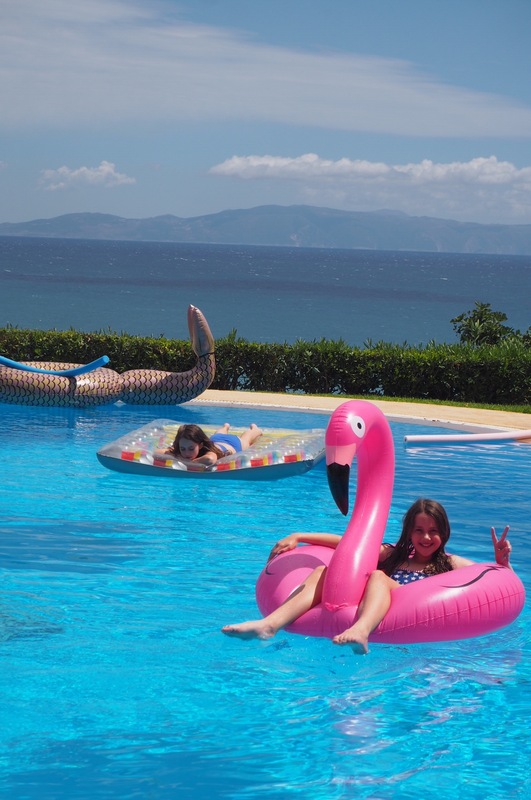 Once we arrived at our villa, the children were desperate to get in the pool, so I put my unpacking duties on hold and starting blowing up the inflatables that we had brought with us. (I bought them from Primark and they seem pretty sturdy for the price. ) Many of you have asked me which villa we are staying in. I hope you don’t mind but we consider it a bit of a find (booked through Airbnb) so I probably won’t share the exact one as we come every year! But I would recommend looking at Airbnb. Liv on ‘Kevin’ the Flamingo. On our first night, we always go to Waterway Restaurant in Spartia. The views are incredible and the food is pretty good too. 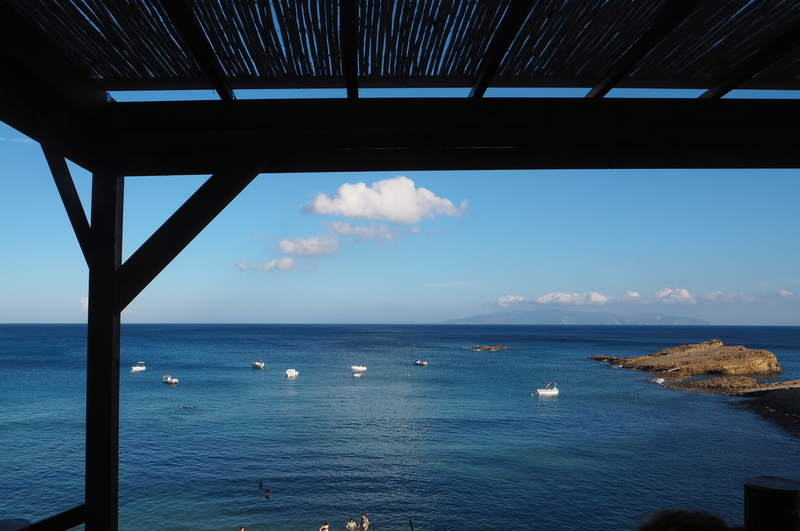 There is a lovely little beach below where the children like to play while we have pre-dinner drinks. The staff, who we have got to know over the years, are so friendly and welcoming. 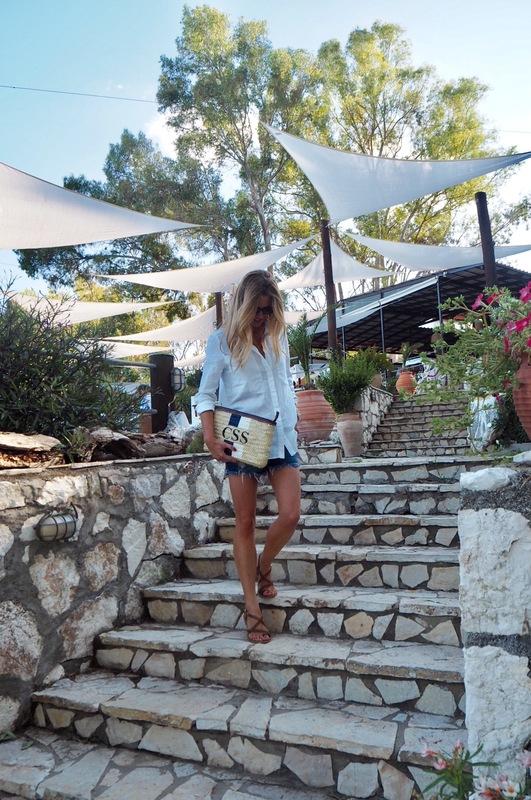 Outfit 1 of the holiday : Linen Shirt Whistles/ Denim shorts H&M / Sandals from Kefalonia and Basket clutch from Baal and Tanit. I wore my failsafe holiday outfit of a white linen shirt, denim shorts and sandals. Now it’s time to listen to the cicadas sing, soak up the sunshine and read a few books. I will be writing up a dedicated holiday outfit post and a places to go post, but probably won’t publish until after we are back.